Is "The Martian" a fantastic film? Indeed. Is this one of Matt Damon's best performances? He's pretty freaking great. Is the film a visual spectacle? Not exactly. What I expected from Ridley Scott (director of "Alien" and "Prometheus") was way more than what he delivered. Sure, the shots of Earth and Mars from outer space are beautiful, but they are few and far between. The film stays pretty close to Andy Weir's novel, thankfully without as much scientific jargon that I admittedly skimmed right over while reading. If you enjoyed "Gravity" or "Interstellar" you will probably enjoy this film. Just be prepared - it's awfully lengthy. 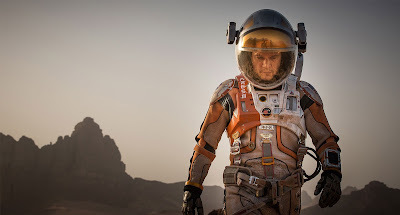 You've all seen the trailer - Matt Damon plays astronaut Mark Watney who gets left on Mars after his crew presumes he's dead. Surprise! He's very much alive, and has to figure out how to spend the next 3 years (when the next planned Mars mission lands) alive on a planet that doesn't grow food and has nearly every element that would work against him. Luckily, his botany skills come into play and allow him to grow potatoes, and his chemistry knowledge enables him to create water to help them grow. But just about every time something goes his way, something throws a kink in his plan. Back on Earth, when NASA discovers that he's alive and well, engineer Vincent Kapoor (Ejiofor, whose star continues to rise), PR specialist Annie Montrose (a surprisingly boring role for the usually lovable Kristen Wiig) and Head of NASA Teddy Sanders (solid Jeff Daniels, as per usual) set about devising a rescue plan. They also decide to not inform Watney's crew that he's actually alive. As plans are hurried and ultimately fail, NASA is forced to inform the crew, and also partner with the China National Space Agency to make Watney's rescue a reality. The beautiful Jessica Chastain plays Commander Lewis, who feels the most guilt at leaving Watney behind. Chastain's talent isn't really showcased in this film - she didn't have much to work with. The same can be said for Michael Pena and Sebastian Stan, supporting crewmates and solid supporting cast members, who got very little screen time and material. Damon does a wonderful job at keeping Watney's sense of humor throughout the film, as Weir depicted in the book. Watney never really loses it, and we don't ever see him get totally desperate and just give up. The fact that everyone on Earth is rooting for him and the smartest people in the world are working towards finding a solution must have given him hope. The final shots left me wanting a little more visually and emotionally. What's intended to be the film's climax almost gets you there, but doesn't give you a full emotional release. That may be partly due to the filming and choice of shots, but it also might be that we've watched him struggle for 140 minutes and are frankly ready for something to finally go his way. I enjoyed this film, for the most part. (I especially enjoyed looking at Damon's hunky bod, until that awful body double scene.) This film remains #1 at the box office after a month. It will be one of Damon's most memorable roles, and will last long into Ridley Scott's film legacy.